I think I am doing this right. 1 waystrider 10 forest guardians 5 waywatchers. The guardians have not been painted so Ill be working on them. I thought of trying the sisters of Averlorn, but want to play some games before further expanding my army. Unit sizes seem a bit different on there, but for 500 points I will do 1 Waystrider, 10 forest guard, 6 way watchers and a great eagle. Comes out to 500 exactly. I've been needing to finish the eagle, so that's perfect. I played 2 games against Jeff today. My first impression was that you cannot play this game on a 3x3 table, as everything I had died by the start of turn 2. The second game we played was on a 4x4 and was a.bit more fun. The only thing we couldnt find was the purpose of terrain other than giving a -1 to hit. I will say it was fun to put fantasy models on the table again, and I look forward to getting in some more games. Sorry the smaller table size didn't work, I figured small war bands and more tables open for others would be good. Just an FYI, terrain gives +1 armor. You are also supposed to roll a die for each piece of terrain per the basic rules. That will give it different properties. 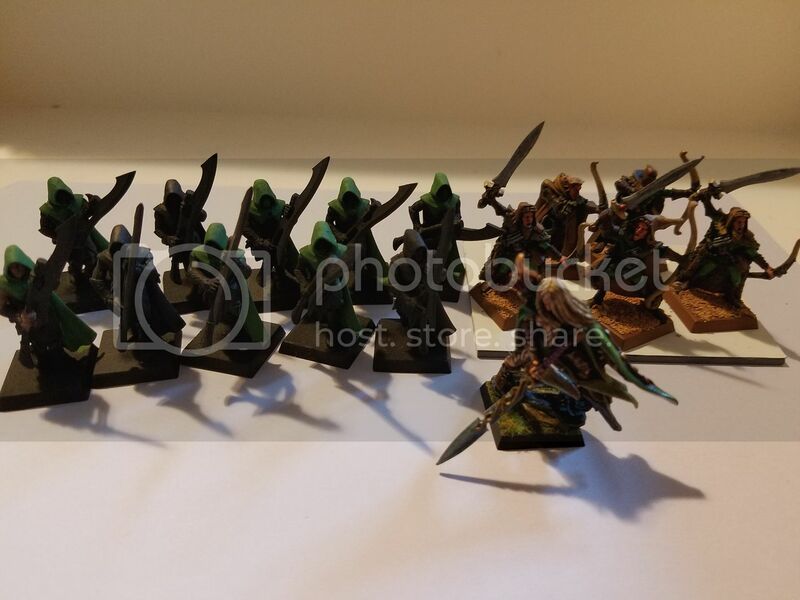 From the 2 games I played, I am adding 10 glade guard and 8 glade riders from 2 rolls on the followers table. I will post up pictures of them in the next day or so. Glad to see you making rolls on the table, very fun! I will however simply reroll if I get a unit that I dont own. You mean you don't buy a new Treelord on the spot?